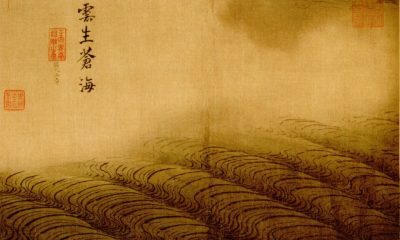 Zhang Daqian is considered the greatest Chinese artist in the last 500 years. If this is true, then what in fact makes Zhang Daqian so important?  This short introduction can only sketch a brief outline of the artist’s life and achievements. Its purpose is to give an aroma of the time and places he’s been and some of the highlights of his huge legacy that’s only beginning to be catalogued. There’s a lot to say. There’s no biography in English. 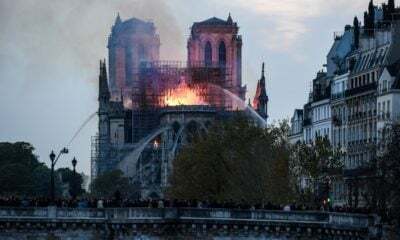 But the facts we know show us someone of superabundant creative energy, charismatic personality and unlimited talent to draw and paint anything he sees. His life begins auspiciously. Shortly before he was born in 1899, his mother dreamt an old man presented her with a large shining bronze basin saying, This is for you.’The tiny figure inside looked at her quietly. The old man said, Take care of him. There are three things he doesn’t like: the moon, meat, and fishy-smelling food. When he was born meat repulsed him and he always cried if he looked at the moon. And he didn’t eat fish. This story makes the little Zhang sound like someone who’s destined to be different, a mysterious baby with greatness attached to him even before he’s born. With his mother’s encouragement, he starts painting at age 9. She teaches him to love art, draw and paint. His older brother, also a successful artist, who paints lions, plays an important role in establishing his brother Zhang in the art world. They travel to Japan in 1919, where Zhang attends a college and learns about dying in the textile trade. He wanted to please his family and become a businessman but after two years he decides to become a professional artist instead and he moves to Shanghai. An important side to his personality surfaces in 1919 when he impetuously cloisters himself at a monastery outside Shanghai to avoid an arranged marriage after his girlfriend dies. His time there, where he practices his art quietly while he deliberates his future, would be repeated in other monasteries near Chengdu where he stayed from 1938-1940 than in 1941-1943. His religious nature led him to practice Taoism too. He spends time in a famous Taoist temple in the mountains near Chengdu called Shangqing Gong and lives there intermittently from 1943 to 1948. He found the atmosphere delightful and painted nature scenes, birds, and animals. 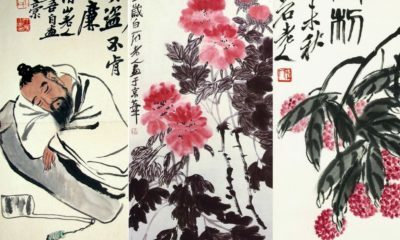 Part of learning to be an artist in China is copying the great masters. Zhang Daqian is so talented at this he discovers he can reproduce them perfectly. 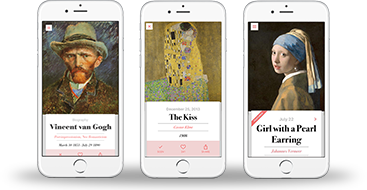 He also learns that connoisseurs who view his reproductions believe they’d discovered the real thing. One connoisseur is so sure he’s getting the original that he won’t let Zhang say no to his request to purchase the copy. Zhang relates this incident in his own words and describes how it happened. 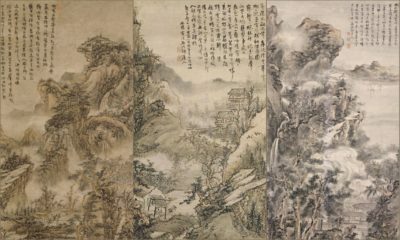 The masterpiece is a copy of Shih Tao, a traditional style that shows how meticulous the artist had to paint to copy it so perfectly. Zhang’s perfect reproductions bring in over ten million dollars during his lifetime. Many important national galleries own them, some without knowing if they are authentic or a copy. After years of travelling widely in China, practising calligraphy, ink-brush painting, exhibiting, and collecting paintings of great Chinese masters he admired, in 1936 he’s asked to be a professor at the National Central University, Nanking, where he soon finds an outlet for his adventurous spirit. Zhang Daqian and a group of artists go on an excursion to Dunhuang in northern China and start a long project copying the religious cave paintings there that were deteriorating after hundreds of years of neglect. The project lasted for almost three years. The experience changes his life not only as a painter but also in a spiritual sense when he discovers his roots in these evocative scenes of religious devotion. 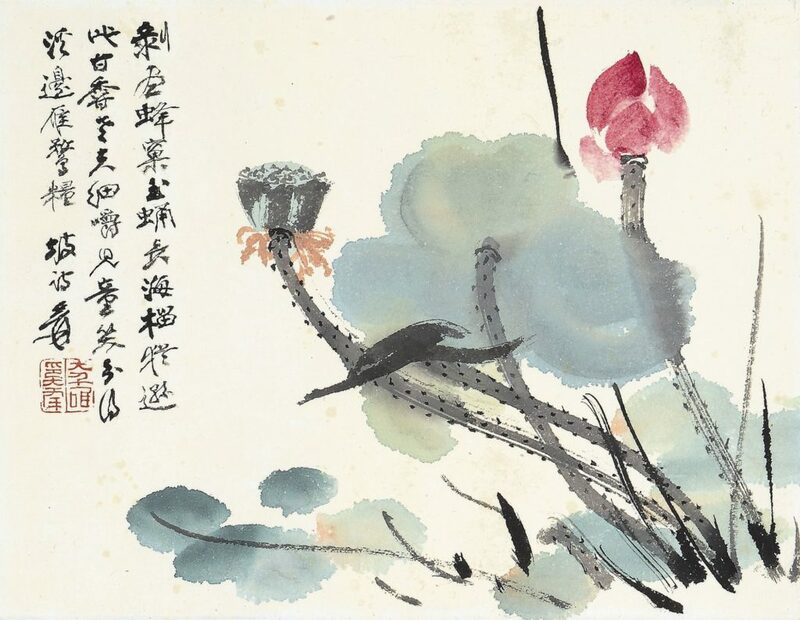 After this, Zhang Daqian paints the lotus blossom in a myriad of ways. 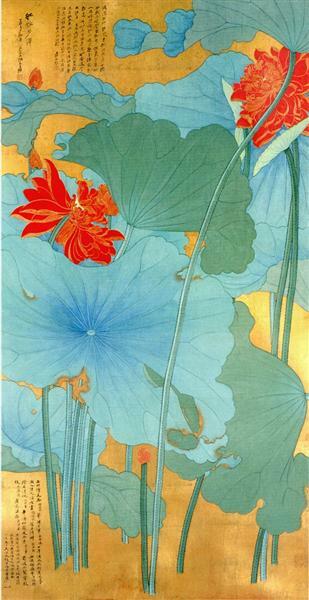 The lotus is symbolic of the purity of body, speech, and mind. It’s rooted in mud; its flower blossoms crown the long stalks as if floating above the muddy waters of attachment and desire. It’s a central symbol of Buddhist detachment in the quest for enlightenment. Another quest in Zhang’s life, that takes him away from China for the next thirty years, begins when he flees his country during the great political changes taking place then. In 1948 he goes to Hong Kong then Japan, then in 1950 to India where he has several exhibitions. The works he completes in Darjeeling mark the zenith of his mastery of traditional fine brushwork, or gongbi technique. Riding in the Autumn Countryside, is a good example. 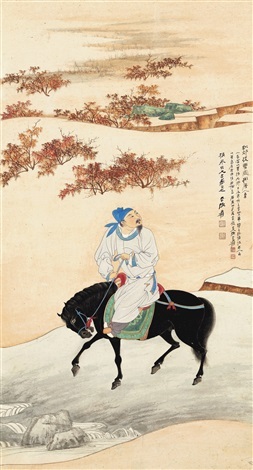 The central white-robed figure is finely drawn, riding a black stallion along a hill with finely drawn sparse brown landscape forms in the background with calligraphy down the right side. He paints many pretty women in this style too. In 1952, ever restless for new experiences, he sells an expensive painting and continues his exile. Zhang Daqian can now afford to take his family to South America where he rents an estate, twelve miles outside Mendoza, Argentina. And the sound of waterfalls is music enough. 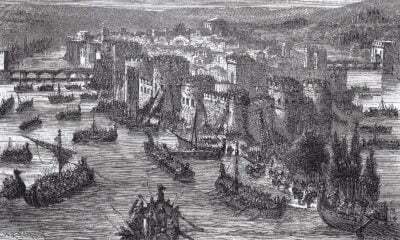 With reading and the composition of verses. This idyllic life in Argentina changes a year later for another location just as beautiful, in Brazil, where he builds a house and develops the gardens, ponds and pavilions in the Chinese style. He stays here until 1971. 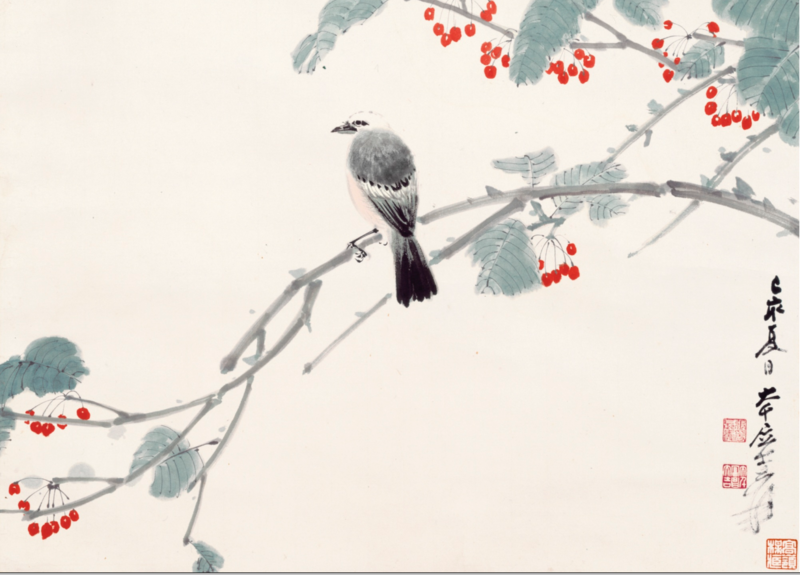 It’s been estimated that Zhang Daqian painted five hundred paintings a year. He exhibited them in Europe and other parts of the world where he travelled regularly. In 1960’s he travels to Carmel, California, a mecca for artists on the west coast of the U.S. Some of his friends live there. He likes the scenery, especially the pine and cypress trees, so in 1971 he moves from Brazil to a new residence at Pebble Beach, near Carmel, California. From the 1960’s he begins to paint in a new style called splash-ink painting. It has expressionistic and impressionistic qualities that create the impression of a dream-scape of predominantly blue and black colors. This style of painting is very well received and recently Christie’s has sold them for vast sums to eager buyers. At the end of his life he becomes homesick and returns to Taipei and builds a residence near the Palace Museum. This residence is a museum now. He died there in 1983 and his ashes are interred under a huge rock he brought back from California. 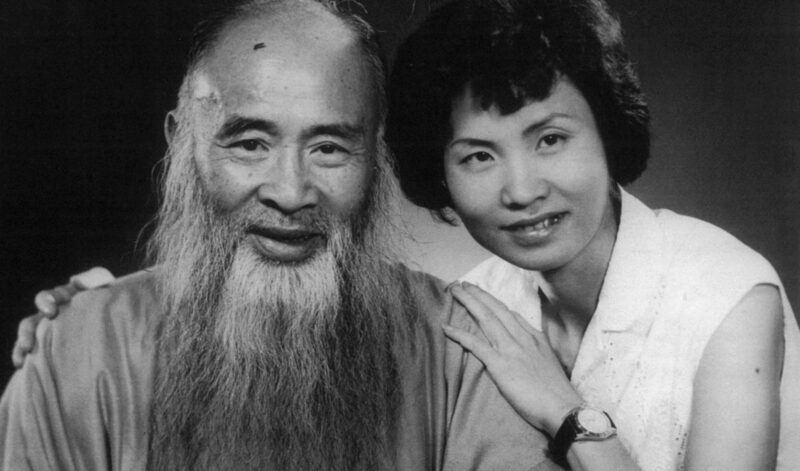 Zhang Daqian’s legacy is enormous. 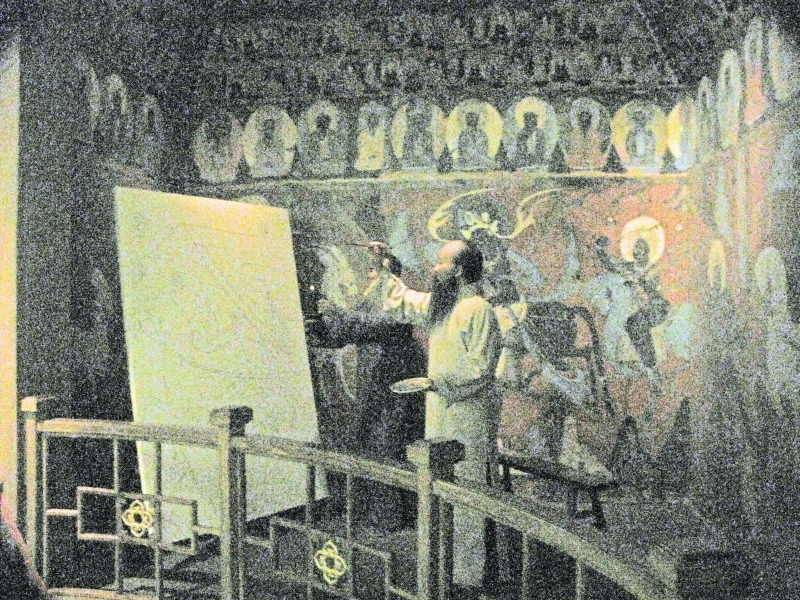 He painted 30,000 paintings of great quality and in many styles. He’s a modern legend in China and recently he’s been recognized in the West. 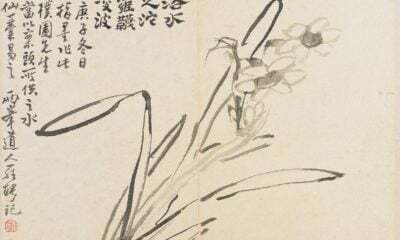 His paintings have generated great interest in the way he’s added western-style expressionism and impressionism to a traditional style Chinese subjects. This new style gives him great notoriety as a brilliant innovator. His reputation is still being established. 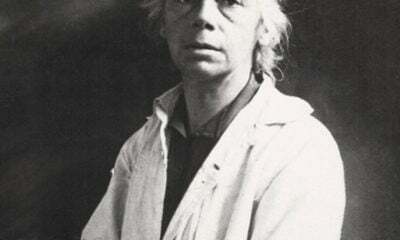 Only five percent of his paintings have been cataloged. Exhibits are shown in prestigious galleries in China and around the world. His paintings have brought in more at auction than Picasso’s. His status is tarnished by his brilliant forgeries, but his other work shows his greatness as an original artist of the first order. He’s a gargantuan giant, a lion among painters, an astonishing artist that only comes along once in five hundred years! Johnson, Mark. 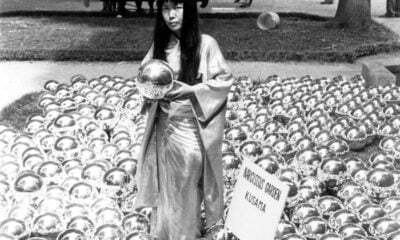 Chang Dai-chien: A California Reintroduction, San Francisco State University, 1999. Lai, T.C. Three Contemporary Chinese Painters, Univ. of Washington Press, Seattle, 1975. Sullivan, Michael. Modern Chinese Artists: a biographical dictionary, Univ. of California Press, Berkeley, 2006. Splash Art Painting Surges in Value, Shanghai Daily, Monday, October 21, 2013.